The decision follows months of opposition by residents of the Nason's Corner neighborhood. 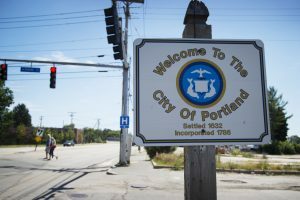 A council committee then endorses a plan to pursue a 150-bed facility elsewhere in Portland. 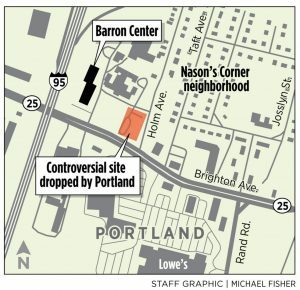 Portland officials have dropped a proposal to build a homeless shelter on land next to the city-owned Barron Center – a plan that riled Nason’s Corner residents and ignited a citywide debate over how to best help some of the city’s most vulnerable residents. City Manager Jon Jennings told the City Council’s Health and Human Services and Public Safety Committee on Tuesday that the city staff no longer believes the Barron Center campus is appropriate for a 150-bed shelter and soup kitchen, although the city is keeping open the possibility that one or more smaller, specialty facilities may end up there. The announcement came before the committee’s formal endorsement of a plan to build a single city-run homeless shelter to replace the aging and outdated Oxford Street Shelter, which has been in Bayside for over three decades. The three-member committee unanimously endorsed building a new city-run shelter with up to 150 beds, and also endorsed possible partnerships with nonprofits in the area that could create additional smaller facilities for seniors, the mentally ill and homeless women. “If the committee feels as though this is the appropriate model to pursue, with our two current partners and the possibility or probability of other partnerships with others, such as (the social services agency) Preble Street, we as staff no longer believe that the Barron Center is the appropriate location for the emergency shelter or the homeless service center,” Jennings said. City Councilor Belinda Ray, who leads the committee, said the Barron Center is being dropped as a potential shelter location partly because of informal conversations with other city councilors. “I don’t think there’s will on the council to place it there, and people have different reasons for that,” Ray said. The city has yet to identify other preferred sites. Although pleased with her committee’s recommendation, Ray said much work – and controversy – remains ahead as the members delve into specific locations – work that could begin in January at the committee’s second meeting. Residents of the Nason’s Corner neighborhood had organized to oppose the plan, saying it would bring the crime and other problems that have plagued Bayside to their quiet residential neighborhood. Maya Lena, president of the Nason’s Corner Neighborhood Association, said neighbors are pleased that the Barron Center is no longer being considered for the city shelter. However, the group still has many questions that need to be answered before it can get behind one or more specialty facilities being built nearby. The Oxford Street Shelter can accommodate 154 people sleeping on thin mats placed on the floor. It is routinely over capacity, so city officials often set up an additional 75 mats at the Preble Street day shelter to accommodate the overflow. Ray believes 150 beds will be large enough, as long as staff continues its efforts to find housing for people who stay at the shelter for long periods. Although numbers have been climbing at the city’s Family Shelter, she said numbers at Oxford Street are trending downward. City staff believes the nonprofit partnerships would allow Portland to focus on an emergency adult shelter with 150 or fewer beds and additional services such as meals and health care. The committee vote brings to a close a debate that’s been raging for months about potential shelter models. Over the summer, the city staff recommended building a 200-bed shelter for adults at the city-owned Barron Center nursing home property on Brighton Avenue, near the city border with Westbrook. The harsh criticism from the Nason’s Corner neighborhood prompted the council to ask staff to look for other locations and other models while keeping the Brighton Avenue site as a possible location. The proposed 200-bed homeless service center would have been built on a parcel of city-owned land at the Barron Center campus on Brighton Avenue, near the city’s border with Westbrook and miles from downtown Portland. A new staff proposal unveiled two weeks ago would include a consolidated city shelter while also working with two nonprofits, Avesta Housing and Opportunity Alliance, to create specialized facilities for the mentally ill and adults 55 and older who need assisted living. City Councilor Brian Batson, whose district includes the Barron Center, was not initially supportive of the staff recommendation for a 150-bed shelter and partnerships with Avesta Housing and Opportunity Alliance. Batson, however, voted in support of the staff recommendation on Tuesday, after making it clear that the city would pursue additional partnerships, including with Preble Street, which says it is willing to operate a new women’s shelter. “Preble Street’s proposal was ultimately the driving force behind me being able to get behind the single, city-built shelter,” Batson said. Preble Street had not responded to requests for information about its involvement in the city’s shelter planning process, but Acting Executive Director Donna Yellen told the committee Tuesday that the agency is interested in building and operating a women’s shelter with up to 80 beds that would coordinate services and care for women struggling with substance use disorder, mental illness, violence and trauma. To do that, however, the city would have to donate land in a location deemed mutually acceptable to the nonprofit and city, which would take on the design, development and construction of a new shelter. Although the committee recommendation is for only one city-run shelter, Mayor Ethan Strimling said it moves the city closer to the scattered-site model that he has advocated. But Strimling still thinks a 150-bed facility is too large and will be difficult to site.